Can I use TV instead of medical grade monitor for Endoscopy? Can I use High Definition TV instead of medical grade monitor in Endoscopy? How do I choose the right endoscopy monitor within a tight budget? Several healthcare providers with budgetary constraints ask this question. Medical grade monitors are far more expensive as compared to similar sized TVs and there is often pressing need to save cost. There is also general assumption that ‘high resolution’ is the most important factor in choosing a monitor. Given the availability of several options of high-definition Televisions, why not use them? 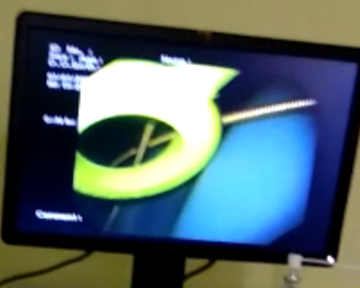 Some surgeons I talked to said they found a high-definition TV was quite good enough and features that medical grade monitors talk about were not all that needed. Some even say it is all sales gimmick. Three features on which TVs are comparable to medical monitors are – resolution, screen size and display technology. Resolution – In terms of resolution today HD, FHD, 4K UHD are all commonly available in TV as well as medical grade monitors. Screen size – Screen sizes starting from 19” to 55” are available, while most commonly used may be 26”. Display Technology – LCD/LED/ CRT, while CRT TV may be low in resolution and not suitable for medical purposes, LCD TVs are commonly available today. Brightness/ Luminance/ Backlight – Medical grade monitors have 10 times superior luminance that helps differentiate tissues, abnormalities etc, much better. Most importantly medical monitors are designed to have longer luminance stability (say 4 years vs 1 year) as compared to commercial display devices. This alone may justify the cost of medical grade monitors in the long-term. Colour calibration – Medical monitors are colour-calibrated to differentiate different tissues, vessels etc. more accurately as compared to other monitors. Contrast ratio in medical monitors is also higher than ordinary monitors or TV. Most TVs do not offer the high brightness (1000+ cd/m2), high contrast (>1400:1) and clinical colour calibration that medical monitors come with. Angle of view – Angle of view is an extremely important factor. In medical grade monitors, image reproduction is accurate and efficient regardless of viewing angle. This is not true for TVs and other monitors. This factor can make big difference in accuracy of diagnosis and treatment. Dis-infectability– Withstanding fumigation/ dis-infection procedures and elecro-magnetic interference in OT are important from the point of longevity of equipment. Medical monitors are built with components isolated/ protected from impact of regular fumigation done in OT. They are also tested for electro-magnetic interference from other equipment in Operating Theatres. Other normal display devices will soon get spoiled in Operation Theater environment. DICOM compatibility – Digital Imaging and Communications in Medicine is the standard for the communication and management of medical imaging information and related data. DICOM is most commonly used for storing and transmitting medical images enabling the integration of medical imaging devices. Medical grade monitors are DICOM compatible and ordinary TVs are not. If you are using Electronic Medical Records and store images directly from other imaging modalities, Endoscopy, cardiology scans, DICOM compatibility is required. Connectivity – Digital Video I/O is an extremely critical factor, especially in case of Endoscopy, cardiology, angiography etc. video output is essential. TVs may not have all types of input/ output formats supported, most have only HDMI or USB ports for input. As far as connectivity is concerned, one will have to check the connectors compatible with endoscope output and if required go for a converter to HDMI/ USB since TVs only support HDMI and USB ports for input. The type of converter depends on the output types your endoscope has. Important thing to note is any use of converter deteriorates the quality of image somewhat. Other features in medical grade monitors include, Anti-bacterial, Water-proof, Touch-screen, Anti-glare, portable/ wall-mounted etc. If you have funds constraints and must go for a TV instead of medical monitor – FHD or 4K UHD TV are good in terms of resolution. Most of the UHD TVs come in large screen sizes (>48″). 26″–32″ would be more suitable for hospital use. Alternately, one could consider used medical monitors or refurbished medical monitors.